It was 5pm on a friday evening in Gold Coast, Australia and the peak-hour traffic was steadily building up. As we rolled the new Bentley Continental GT to a stop at a traffic light, we felt someone staring at us. Instinctively, we turned our heads to the left and met the eyes of a buff middle‑aged man in a muscular truck. With a warm smile, the stranger pointed enthusiastically to our car, before flashing us a thumbs up. “Do all Bentley owners get a similar reaction when they’re on the road?” one of us wondered aloud. Whatever the answer, it isn’t difficult to understand why the man liked what he saw. The third-generation Continental GT is definitely good-looking, but Bentley’s designers will have you know that its beauty comes with very careful planning and utilising revolutionary technology. Aesthetically, the coupe’s dimensions remain more or less the same as its predecessor, although you might think otherwise while observing some of its new visual features—a lower bonnet, a broader matrix grille, a faster sloping roof, shorter overhangs and new elliptical tail lights, which bear the same stunning three-dimensional cut-crystal effect as the headlights. At the same time, you will also notice that the car boasts sharply defined body lines that frame curvaceous surfaces such as the muscular haunches sheltering the rear wheels. This was where Bentley took notes from two classic machines—the original Bentley R-Type Continental and the 1936 Spartan Executive aircraft—and obtained the Continental GT’s elegant new look using a modern technique called Superforming, which heats sheets of aluminium to 500°C to make them more malleable, before placing them over a mould and vacuuming the air out. Is The New Lexus UX Really Worth The Hype? The car’s interior also marries elements of the old and the new. The rotating display located at the centre console, for instance, remains hidden under a wood veneer until you start the car. When you do, the panel revolves to reveal a 12.3inch touchscreen, while a third side features a trio of analogue dials that shows a compass, a chronometer and the outside temperature. Bentley also pays tribute to the world of watchmaking with an optional, rippled aluminium finish called Côtes de Genève for the car’s centre console, which is an industry first. There is a choice of eight single veneers, including a new mid-toned option Koa, which is traditionally used in its native Hawaii to create surfboards and guitars. Alternatively, owners can pick the unique two-toned wood option, which pairs any of the veneers with a Piano Black finish. And as if all these aren’t enough to remind you of the marque’s attention to detail, the new diamond-in-diamond leather quilting introduced with the car is an option that’s hard to miss. Varying in size throughout the cabin, each diamond is created from 712 stitches, which amounts to a total of about 310,000 stitches and 2.8km of thread used per car. Luxurious design aside, does the Continental GT fulfil Bentley’s dream of building the greatest grand tourer in the market? We travel to the Alps to find out. Since Bentley launched the first Continental GT in 2003, it has sold about 70,000 units of the luxury coupe, thus cementing its position as the marque’s most successful model to date. After all, there are very few grand coupes that seat four in comfort and boast a powerful 12-cylinder engine able to rival that of a sports car. However, Bentley is fast seeing its stronghold in this niche sector threatened as its peers have noticed the market potential and are coming up with strong alternatives to the Continental GT. Nonetheless, Bentley isn’t wavering. Even in light of growing global environmental consciousness, the marque has kept the massive 6.0L twin-turbocharged W12 engine as part of the Continental GT’s identity, except that it has welcomed a raft of technological innovations to improve the engine’s efficiency and green factor. So while its power has significantly increased from 590hp and 720Nm of torque previously to an impressive 626hp and 900Nm of torque, the car drinks 12.2L/100km—a good 2.0L of fuel less than its predecessor for the same distance travelled. Naturally, its CO2 emissions have also fallen, and by 16 per cent no less. To help optimise the car’s overall efficiency, there’s a Variable Displacement system that shuts down half of the cylinders in the W12 engine during lighter loads. An eight-speed dual clutch transmission replaces the previous automatic gearbox, and features a sailing function that allows the car to freewheel at cruising speeds when conditions are right so as to minimise fuel consumption. The new transmission also delivers noticeably smoother and quicker shifts when the car drives in comfort mode, which is better suited for the sportier character of the new model. As a result, the car is able to sprint to 100km/h in just 3.7sec, which is nearly 1sec quicker than its predecessor. It also has a higher top speed of 333km/h, which is some 24km/h more than before. On the road, its most impressive ability has to be the explosive way it overtakes, leaving slower vehicles floundering in its wake. In Sport mode, the car thrills you even more with a surprisingly raucous soundtrack that matches well with its agility. 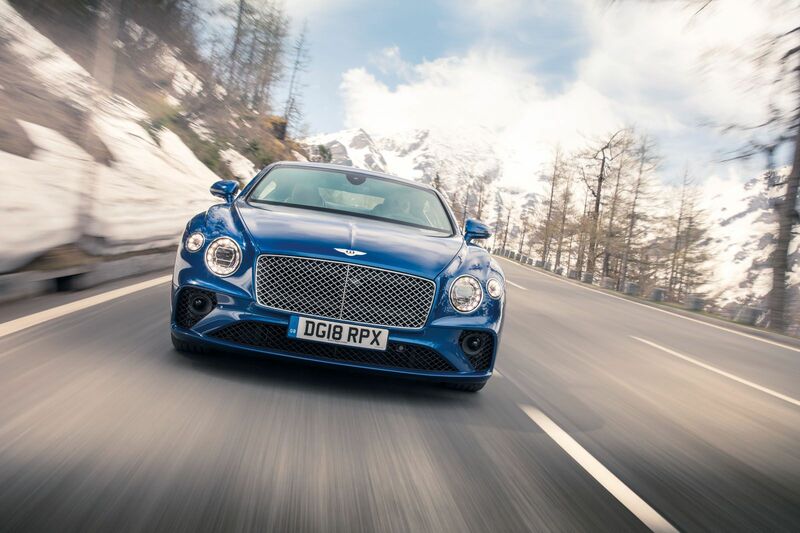 Although, we find that the Continental GT navigates the windy roads of the Tyrolean Alps between Austria and Italy best in “B” (which stands for Bentley) mode—there is enough sharp handling without an obvious drop in comfort. Effectively, Bentley sits at the crossroads between modernity and tradition. There are certain values it sticks to as part of continuing its legacy, and there are others with regards to performance that it must take on to fight the competition. The new Continental GT shows that the marque has done well to strike a balance between both sides while raising the bar with a car that will be remembered for its superb craftsmanship, design, technology and performance long after it’s gone. Toys How Did The Lexus NX300 F Sport Fare On The Road? Toys How Does The Lexus LC 500 Coupe Measure Up?